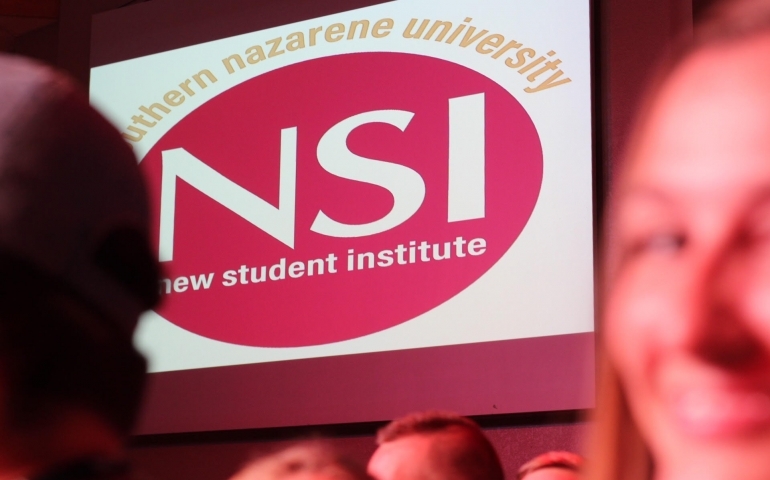 The intention behind New Student Institute is to integrate students in the campus community, hopefully giving them a more comfortable transition into SNU. During NSI, students are getting out of their comfort zones and doing new things. There have been numerous opinions about NSI, mostly positive but some negatives. I spoke with two students who attended NSI: Freshman Hillary Cantwell from Denver, Colorado and transfer Noah Truitt from Bethany, Oklahoma. Cantwell is a Nursing major. Truitt transferred to SNU from Central Christian College in Kansas and is majoring in Pre-Physical Therapy. Both students felt NSI was beneficial and both said the events were socially appealing. They were able to meet new people and get out of their comfort zones. When asked about his favorite part of NSI, Truitt said, “Meeting other transfer students in same family group and getting to know people going into the year.” He spends most of his time with the other transfers in his family group. They were then asked what they would change about NSI. Cantwell said, “I wish they would have included more about printing and more of the school side of things, like where my classes are, Moodle, knowing how to set up laptop, stuff like that.” Truitt said he wished some of the meetings were shorter. Both Cantwell and Truitt expressed what most students have also said about NSI. Abby Williams, Staff Writer Abby Williams is a freshman studying Mass Communication. She is excited about writing for the ECHO. Abby is usually working the front desk in the Admissions Office and she enjoys meeting new and prospective students. When she is not at work she is probably napping or hanging out with her friends.